Saskatoon Transit has 15 new buses on the road with the help of the Public Transit Infrastructure Fund (PTIF). The new buses are included in the total $24 million contribution towards fleet renewal in Saskatoon. The new 12 metre (40 foot) buses are fully accessible, have automated passenger counters, contain the latest Intelligent Transportation System technology and are more fuel efficient. The buses leave a smaller environmental footprint because of improved emissions, but also because they are paint free. They also come with lower long term operating costs, due to the use of more durable materials. Upgrading the Saskatoon Transit fleet with new buses instead of 10 year old buses saves approximately $40,000 per year, per bus. With fleet updates over the last five years, Saskatoon Transit has realized a fuel consumption savings of approximately $165,000 per year (based on today’s fuel prices). Saskatoon Transit will also be receiving eight smaller 9 metre (30 foot) buses this year funded by PTIF. Two will be added to Access Transit’s fleet and the remaining will be used for conventional transit. Saskatoon Transit Buses Get Fans to the Rush Game! Saskatoon Transit encourages Rush fans to avoid traffic and parking by taking the bus to the Saskatchewan Rush game on Friday, January 19, 2018. After the game, buses will depart SaskTel Centre as they fill up. For regular bus schedules and other trip planning tools including the real-time Transit app visit saskatoontransit.ca. All new schedules are available at saskatoontransit.ca and will be made available at the Transit Customer Service Centre. Customers can plan their trip with the updated schedules and real time tracking through Google Transit and on the Transit App. Citizens are encouraged to plan their trip in advance and review updated schedules before traveling. Buses depart SaskTel Centre after the game as they fill up (around 9:15 p.m.). For regular schedules and other trip planning tools, visit saskatoontransit.ca. Impaired driving has deadly, life-changing effects. Enjoy yourself this New Year’s Eve, but make a safe choice and take Transit for free. 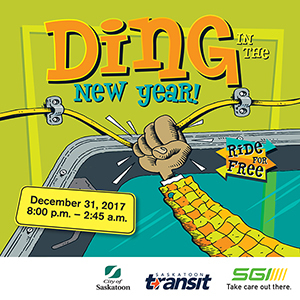 Since 1989, Saskatoon Transit and Saskatchewan Government Insurance (SGI) have partnered to offer free Transit and Access Transit service on New Year’s Eve. For Nolan Barnes, the wrong choice had irreversible consequences; an impaired-driving crash in May of 2010 left Barnes paralyzed and a close friend dead. Barnes says, making a choice to have a safe ride home not only helps individuals but everyone trying to get where they’re going. “Make the resolution not to drink and drive,” he says. Free bus service, starts at 8:00 p.m. on Sunday, December 31 and will run until 2:45 a.m. (times may vary slightly by route). The police service adds its support and advice for thinking ahead for New Year’s Eve celebrations. “It is crucial everyone has a solid plan for getting home safely before they head out for the evening,” says Saskatoon Police Service Staff Sergeant Patrick Barbar. Planning is easier than ever: customers who are new to Saskatoon Transit as well as current riders are encouraged to use the free Transit app to plan their route. Wait at a regular stop or flag down a bus at any point along the route, if you are in need of a ride. McDonald says Saskatoon Transit is thankful to have SGI as a partner again this year to provide free service. Saskatoon Transit wants to help eliminate the hassle of parking and offer shoppers access to multiple shopping destinations as efficiently as possible. To do this, Transit is piloting a program called Jingle Bell Express — a new holiday service that will take shoppers on a loop to four malls. Residents are encouraged to use the Transit app to find the bus stop closest to them. Individuals will be able to board the bus and pay using their usual method of payment or $3 in cash. This will be of particular advantage to families who purchase a day pass which will allow four people (max of two adults) to ride for a 24 hour period on the weekend for only $8.50. Day passes can only be purchased at the Saskatoon Transit customer service office in the downtown terminal. The Jingle Bell Express route and schedule will be available on the Transit app (route #1225). All those who use the service will be encouraged to take a short, 4 question survey and be entered to win one of four $100 gift cards to one of the participating malls. At its November 20, 2017 meeting, Saskatoon City Council approved the Preferred Configuration for a re-envisioned transit system based around Bus Rapid Transit (BRT). The report brought forward by Administration presents recommendations for an appropriately-sized future Bus Rapid Transit system that will support the City’s anticipated growth. This approval provides direction to HDR to move forward in developing a Functional Plan that will further refine the scale and cost of the new Bus Rapid Transit System, and anticipated changes to existing transit services. A detailed online engagement survey will be available at https://www.saskatoon.ca/engage/transit-plan. This survey is open to the public and will be sent to the City’s Citizen Advisory Panel, and to those subscribed to the Plan for Growth Newsletter updates. Stakeholders will be invited to RSVP to a number of workshops hosted by the City and HDR. Inc. designed to help understand the needs of those impacted most by the proposed changes. Join the City of Saskatoon and HDR as we share information on the Bus Rapid Transit Preferred Configuration and how these features are tailored specifically for Saskatoon. We also want to share information on transit network principles and how the Bus Rapid Transit system will re-shape the Saskatoon Transit network. We want to work with you to understand how these changes may affect you. The next round of input on the Transit Plan is scheduled for January 2018. To learn more, visit Saskatoon.ca/engage. Transit Signal Priority (TSP) – The preferred configuration for the Saskatoon BRT is to apply TSP at all beneficial locations. Transit signal priority measures are considered the foundation of a BRT system. They can provide significant travel time and reliability improvements at a relatively low cost. TSP uses existing infrastructure to determine the optimum way to limit bus delays at traffic signals. Roadway Geometric Measures – The preferred configuration for the Saskatoon BRT is to apply roadway geometric measures at select beneficial locations. Congestion within the Saskatoon road network occurs primarily at major intersections and bridge approaches. Geometric improvements such as queue jump lanes, bus bypass lanes, and other similar measures will provide buses with a time advantage at the most critical points along the corridor. Stations – The preferred configuration for the Saskatoon BRT is to develop medium scaled stations that will accommodate 12 to 20 waiting customers in a safe, protected and well lit environment that will be seen as a positive influence on the public realm and adjacent community. Stations should have a common design theme; however, each one would be sized to accommodate the expected customer traffic at specific locations. Customer Systems – The preferred configuration for the Saskatoon BRT customer systems is to provide good destination, wayfinding, route, schedule, next bus information, and security monitoring. Off board fare processing could be added in the future. Runningways – The preferred configuration for the Saskatoon BRT is to develop a mixed-traffic system with exclusive lanes in select short road sections along 3rd Avenue in the downtown, Broadway Avenue, and College Drive. For more information / to sign up for project updates please visit saskatoon.ca/growth. Learn more about engagement opportunities by visiting saskatoon.ca/engage. Downtown Saskatoon will be busy this Sunday for the Santa Claus Parade, avoid the traffic and parking stress by choosing Transit to attend. The real-time Transit App makes it easy to plan your trip downtown for the festivities. Just download the free Transit app to get up-to-date information of where to get on and what bus to take from your “current location” to downtown. Saskatoon Transit encourages the public to experience the convenience of public transit by using the real-time Transit or Google Maps apps. These apps create customized route maps from wherever you are, without having to sort through schedules. Downtown Special Events Stop (23rd Street & 2nd Avenue) – buses will depart every 15 minutes between 9:00 a.m. and 10:15 a.m.
Market Mall – Departure from the mall transit terminal at 9:45 a.m.
Centre Mall – Departure from the mall transit terminal at 9:45 a.m.
Return trips will begin immediately following the close of ceremonies (approximately 12:15 p.m.). Free service to and from SaskTel Centre will also be available for individuals using Access Transit (regular booking procedures apply). For more information on Transit’s free Remembrance Day service, please call Transit Customer Service at 306.975.3100. A special thank you to RBC Royal Bank for proudly sponsoring the free transit service. Saskatoon Transit encourages the public to experience the convenience of public transit by using either the Transit or Google Maps app. These apps help create customized route maps from wherever you are, without having to sort through schedules.